Background: The energy balance is the cornerstone for the body weight management and is inextricably linked to Resting Metabolic Rate (RMR). Over the years, there have been many studies estimating the reliability of prediction equations and several attempts to create new more reliable equations which correspond to specific populations. Objective: The evaluation of the accuracy of prediction of RMR equations in an individual and population basis, the reliability of the metabolic measurement systems and the factors affecting RMR, in order to determine the suitability of their use in diverse populations. Methods: Comprehensive review using keyword combinations derived from the available database. Results: A variation was recorded among the studies. 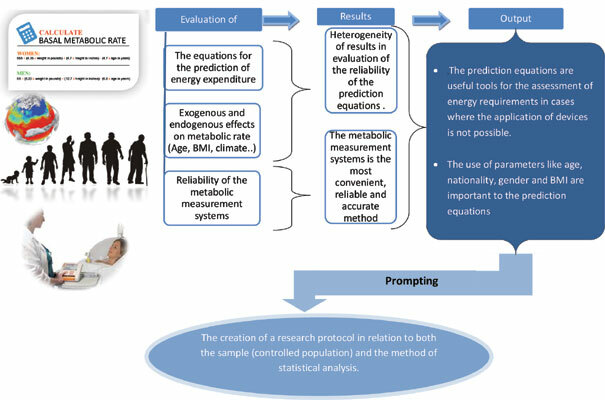 Some of them presented convergence, while others presented significant differences in the comparison between the most commonly used prediction equations and the measured RMR using the method of Indirect Calorimetry (IC). Furthermore, the existing studies have shown that the IC method is a reliable and valid measurement system of RMR. However, the effect of certain factors on the metabolic performance (such as age, gender, etc.) remains under investigation. Conclusion: The measurement of RMR using the IC method is the most convenient, reliable and accurate method. Nevertheless, the prediction equations are useful tools for the assessment of energy requirements in cases where the application of IC method is not possible. However, a research protocol should be performed for the evaluation of the equations in relation to the sample, but also in relation to the statistical analysis in order to eliminate the heterogeneity which may lead to misconceptions and confusion. Basal metabolic rate, indirect calorimetry, predictive equation, resting energy expenditure, resting metabolic rate, statistical analysis.